Streamline your study habits to learn more in less time. Take smarter notes (Hint: Less is more). Provide A+ answers on quizzes and exams. Know which reading assignments are critical—and which are not. Choose an A-worthy paper topic. Write stellar prose without the agony. 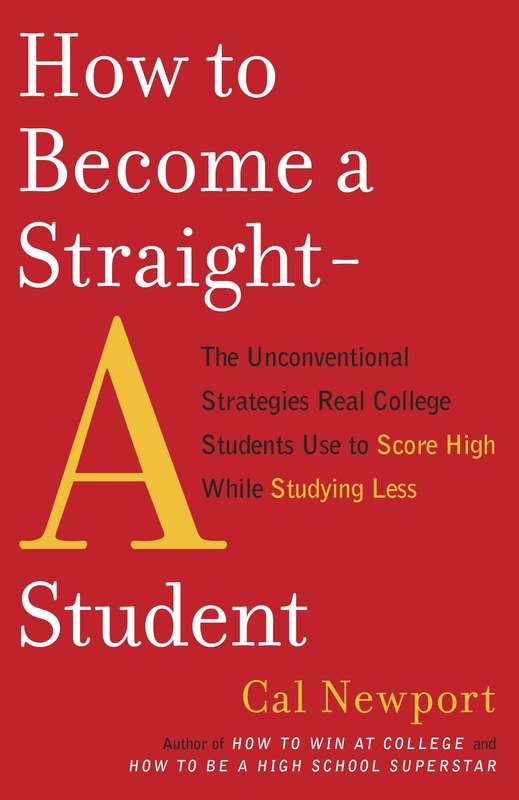 A strategic blueprint for success that promises more free time, more fun, and top-tier results, How to Become a Straight-A Student is the only study guide with the insider knowledge and real-world methods to help you master the college system and rise to the top of the class. —Jason Ryan Dorsey, author of My Reality Check Bounced! A common complaint I hear from students is that they never seem to have enough time to finish all of their work. They vent about how many hours they spend-late nights reviewing in the library, weekends sacrificed to paper writing-but no matter how hard they try, there always seems to be something else due. As Matthew, a straight-A student from Brown, explains, it’s easy for college students to become “stuck in a state of permanent catch-up.” Understandably, these students feel like they have reached their academic limit; they believe that unless they forgo sleep or any semblance of a social life, there are simply not enough hours in the day to stay on top of all their schoolwork. Let’s start by getting one thing clear: This belief is false. The problem here is not the amount of available hours, but rather how each hour is spent. I know this from firsthand experience. While researching this book, I spent time with some of the country’s most accomplished students, and I can assure you that no matter how diligent you think you are, there is a Rhodes scholar out there who fits in three times the amount of work and activities you do and probably still manages to party harder than you would ever dare. I don’t mean to imply that everyone should aim to become a drunken Rhodes scholar (though it would certainly be fun to try); rather, my point is that a surprising amount of work, relaxation, and socializing can be extracted from a single twelve-hour day. A lack of time, therefore, isn’t enough to explain why so many students feel overwhelmed. So what does explain this phenomenon? The answer, as it turns out, has much more to do with how we work than what we’re trying to accomplish. As humans, our minds have evolved to prefer short-term tasks such as “run away from that lion” or “eat food.” Therefore, when you walk into the library on a Sunday morning with the goal of finishing all of your homework and writing a paper, your brain isn’t happy. The idea of spending eight consecutive hours trapped in a study carrel is dispiriting. Plus, it’s hard to focus for that long, so pretty soon fatigue will set in, your concentration will wander, and every distraction will suddenly seem impossibly appealing. Before you know it, the day will be over and you’ll realize that you haven’t accomplished much productive work at all. The next day, new assignments will pile onto those you didn’t finish on Sunday, and the tedious process starts all over again. Jason, a straight-A student from the University of Pennsylvania, uses the term “pseudo-working” to describe this common approach to studying. The pseudo-worker looks and feels like someone who is working hard-he or she spends a long time in the library and is not afraid to push on late into the night-but, because of a lack of focus and concentration, doesn’t actually accomplish much. This bad habit is endemic on most college campuses. For example, at Dartmouth there was a section of the main library that was open twenty-four hours a day, and the students I used to see in there late at night huddled in groups, gulping coffee and griping about their hardships, were definitely pseudo-working. The roommate who flips through her chemistry notes on the couch while watching TV is pseudo-working. The guy who brings three meals, a blanket, and six-pack of Red Bull to the study lounge in preparation for an all-day paper-writing marathon is also pseudo-working. By placing themselves in distracting environments and insisting on working in long tedious stretches, these students are crippling their brain’s ability to think clearly and efficiently accomplish the task at hand. The result is fatigue headaches and lackluster outcomes. The bigger problem here is that most students don’t even realize that they’re pseudo-working. To them pseudo-work is work-it’s how they’ve always done it, and it’s how all of their friends do it. It never crosses their mind that there might be a better way. Straight-A students, on the other hand, know all about pseudo-work. They fear it, and for good reason. It not only wastes time, but it’s also mentally draining. There is just no way to be well-balanced, happy, and academically successful if you’re regularly burning through your free hours in long, painful stretches of inefficient studying. The students I interviewed for this book emphasized again and again the importance of avoiding this trap. In fact, when asked what one skill was most important in becoming a non-grind straight-A student, most of them cited the ability to get work done quickly and with a minimum of wasted effort. Pseudo-work features a very low intensity of focus. Therefore, to accomplish something by pseudo-working, you need to spend a lot of time. The straight-A approach, on the other hand, maximizes intensity in order to minimize time. For example, let’s rank intensity on a scale of 1 to 10 (with 10 being the most intense). Assume it takes ten hours to finish studying for a test by pseudo-working with a low intensity score of 3. According to our formula, this same amount of work can be accomplished in only three one-hour bursts, each with an intensity of 10. The work that took you all day Sunday to complete could instead be finished by studying an hour after breakfast, an hour after lunch, and an hour after dinner-the rest of the day being free for you to relax! With this formula in mind, you can begin to understand why many straight-A students actually study less than their classmates: They replace long, low-intensity stretches of work with a small number of short, high-intensity sessions. Of course, this is not the whole story behind their success; what straight-A students actually do in these short bursts is also crucial-technique is just as important as timing. Part Two (Quizzes and Exams) and Part Three (Essays and Papers) of this book are dedicated to these technical details. But learning how to follow an efficient schedule, and banishing pseudo-work from your college experience for good, is a crucial first step toward your academic overhaul. To accomplish this transformation, however, you will need to gain control over your lifestyle-and that’s often no small task. For example, you will need to spread out the intense work sessions so that you have time in between to recharge. This requires basic time-management skills. You’re also going to have to overcome your urge to procrastinate, because scheduling your work is meaningless if you don’t actually work in the time you set aside. This requires self-motivation. Finally, to obtain the highest possible levels of intensity, you need to choose the right locations, times of day, and durations to study. If you aren’t careful about how you select these three factors, you can unintentionally sabotage your ability to focus. This requires a smart planning strategy. Part One will teach you how to satisfy these requirements. It begins with the presentation of a simple time-management system, customized for the busy college lifestyle. Don’t be frightened, the system is incredibly lightweight-it’s designed to require only five minutes a day of planning and can survive periods of neglect. Part One then continues with a collection of battle-tested strategies to help you fight procrastination. This advice comes straight from the experiences of real students and has been proven to work amid the chaos and distractions of the typical undergraduate lifestyle-it is simple, easy to apply, and surprisingly effective. This part concludes with a discussion of when during the day, where on campus, and for how long to study to maximize your productivity. The students interviewed for this book experimented extensively to find the right answers to these key questions, and, in this final step, I pass these answers on to you. Together, these basic skills are the foundation upon which all the advice in this book is built. Without them, you’ll be unable to implement the specific study techniques described in the parts that follow. Master them, however, and you will experience improvements in all aspects of your life-not just grades. You’ll have more free time, you’ll get the sleep you crave, you’ll party harder, and you’ll be able to devote more energy to your extracurricular interests. So relax. You are about to take your first step toward a much more enjoyable and productive college experience. Most students, however, misunderstand the purpose of time management-they believe it’s used only to cram as much work as possible into the day. But this is not the main motivation behind controlling your schedule. As it turns out, a little planning goes a long way toward reducing your daily stress levels. Having deadlines and obligations floating around in your mind is exhausting-it makes it impossible to completely relax, and, over time, can lead you down the path toward a breakdown. However, once you figure out what work needs to be done and when, it’s like a weight being lifted from your shoulders. The uncertainty vanishes: When you work, you can fully concentrate on the assignment in front of you, and when you relax, you can do so without any anxiety. “I don’t believe in giving up anything,” says Jenna, a straight-A student from Princeton. “Not my social life, not my extracurricular activities, not my academic success.” Basic control over your schedule breeds balance. This is why time management, as Doris stated earlier, is the key to getting the most out of all aspects of your college experience. Requires no more than five to ten minutes of effort in a single twenty-four-hour period. Doesn’t force an unchangeable minute-by-minute schedule on your day. Helps you remember, plan, and complete important tasks before the very last moment. Can be quickly restarted after periods of neglect. We will cover the details of this system in a few simple steps and then conclude with a detailed case study so you can see how it works in a realistic setting. This system requires two pieces of equipment. A calendar: It doesn’t matter what type of calendar, and it’s not something that you have to carry around with you. It can be Microsoft Outlook or iCal on your computer, a cheap day planner, or one of those advertisement-laden freebies they hand out at orientation. It just has to be something that you can reference every morning that has enough space to record at least a dozen items for each day. A list: Some piece of writing material that you can update throughout the day. This you do have to carry around with you, so make it something simple, like a sheet of paper ripped out of a notebook each morning. Record all of your to-dos and deadlines on your calendar. This becomes your master schedule, the one place that stores everything you need to do. The key to our system, however, is that you need to deal with your calendar only once every twenty-four hours. Each morning, you look at it to figure out what you should try to finish that day. Then, throughout the day, whenever you encounter a new to-do or deadline, simply jot it down on your list. The next morning, you can transfer this new stuff from your list onto your calendar, where it’s safe. And we’re back where we started. That’s it. Pretty simple, right? The whole system can be summarized in three easy steps: (1) Jot down new tasks and assignments on your list during the day; (2) next morning, transfer these new items from your list onto your calendar; and (3) then take a couple of minutes to plan your day. Now, we’ll examine these steps in a little more detail. In particular, we need some strategies for how to plan your day each morning using your calendar and what to do when unexpected events interfere and turn that plan upside down (trust me, this will happen more often than not). Find your list from the day before. It will probably look something like the example described in Figure 1. Don’t worry too much about how this list is formatted; we will discuss that shortly. For now, focus on the “things to remember” column, which contains the new to-dos and deadlines that were jotted down throughout the day.